This edition features a fabulous section of color art, "Equipment of the Successor States," done by David Deitrick & Steve Venters, who inked much of the art for early FASA & GDW publications. The section is much more than equipment, showing various mechwarriors and soldiers in uniform in various situations; similar in style to non-RPG weapon and uniform manuals. Jim Holloway does the distinctive cover. "Ten thousand years of organized warfare have culminated in that fabrication of arms and armor, of mobility and strength, called the BattleMech. The typical 'Mech stands 10 to 12 meters tall. Vaguely humanoid, it is an armored giant of myth and legend come to life. The lightest weigh 20 tons, the heaviest 75 tons or more. Even the smallest 'Mech bristles with lasers/particle cannons, long- and short-range missile launchers, autocannon, or machineguns which make it striding, thundering death for any unarmored army silly enough to stand and fight. Also included is substantial background information on MechWarriors and their 'Mechs and on the Successor States and their endless wars. Descriptions of each major house, its leaders, major planets, and its best regular and mercenary 'Mech units provide the beginnings of endless adventures and campaigns. There are also enough facts and figures to run a mercenary unit, including extensive mission tables and: random encounter events. The information on titles and nobility — the goal of every MechWarrior — describes land holdings and, more importantly, annual revenues collected by typical holdings. The most spectacular section of MechWarrior is the 16-page fuil-color section illustrating some of the uniforms and equipment used by major houses and mercenary units." "There's an old saying that claims a 'Mech is only as good as the warrior who pilots it. with the changes and technological advances of the BattleTech universe. Create your unit from the ground up by deciding what and how you want to play, then use the quick-and-dirty character-generation system to flesh out your fighting team. Play character Archetypes such as the MechWarrior, Aerospace Pilot, Tech, or Clansman. Choose your gear from the equipment list, and you are ready to go. Full-color illustrations depict the uniforms worn by the five Houses and four major Clans in the Inner Sphere. The updated rules provide all the information you need for exciting adventures in or out of your 'Mech. With MechWarrior, the BattleTech universe is yours to explore!" "It is the 31st century. Across the vastness of interstellar space, awesome powers vie for supremacy. Amidst this swirl of unending conflict stride BattleMechs, huge robotic weapons of war piloted by elite MechWarriors. Join the action, taking on any one of an endless variety of roles, from spy to smuggler, mercenary to MechWarrior. As a character from the Inner Sphere, the Clans or the Periphery, you will decide the ultimate fate of the galaxy. Enter the exciting BattleTech universe in this all-new third edition of the MechWarrior roleplaying game. This book contains all the rules and source material players and gamemasters need. Completely redesigned for faster and easier play, it features a unique character creation system that generates game abilities and background story at the same time." 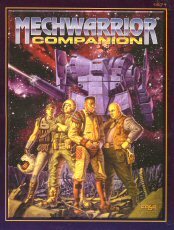 "This companion volume to MechWarrior, Second Edition is an invaluable resource for players and gamemasters alike. 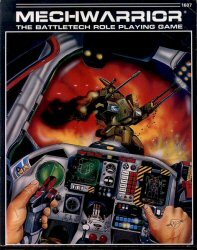 It features guidelines for running an extended military campaign; a wide variety of settings and themes; new skills, advantages and equipment; and a system for combining BattleTech and MechWarrior that puts your character in the cockpit for thrilling first-person combat." "An unknown WarShip's sudden appearance deep in the Clan Occupation Zone may jeopardize a spying mission vital to the Inner Sphere. The player characters must investigate the mysterious arrivals to determine whether they are friends or deadly new foes -- while staying one step ahead of the Clans! 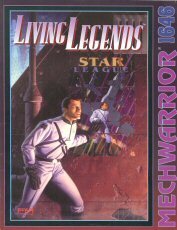 Living Legends is a roleplaying adventure for use with MechWarrior, Second Edition. Set in the BattleTech universe of 3057, the adventure draws the player characters into a centuries-old mystery. The adventure includes a sourcebook section describing life in space and the various systems on board a WarShip, including detailed deck plans." "The Clan invasion left the Successor States struggling to recover from the war that devastated the forces of the Inner Sphere. The Federated Commonwealth took heavy losses, and its misfortune was compounded by the untimely death of Hanse Davion. The alliance is in a precarious position. The New Avalon Institute of Science (NAIS) has been charged to find a technological edge with which House Davion may regain its lost power. Study of Clan technology sent research in bold new directions, and led to an extraordinary breakthrough in BattleTechnology. Unfortunately, the Federated Commonwealth's salvation is in the hands of a madman. 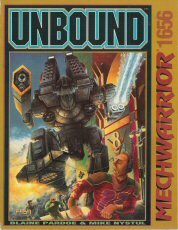 UNBOUND is a roleplaying adventure set in the BattleTech universe of 3053 on the Game World of Solaris VII. The player characters become involved in a struggle for control of a radical new technology that could change the balance of power in the Inner Sphere. The adventure also includes several new 'Mechs and a selection of new tech from one of New Avalon's top research and development teams." "When the Star League crumbled, General Aleksandr Kerensky led most of the Star League army into unexplored space, determined to create a new society free of the Inner Sphere's madness. One Clan dared to defy Kerensky's legacy and was wiped out, its name erased from Clan history. Convinced that remnants of the Not-Named Clan still survived, Clan leaders created a rite to ensure the death of any whose heritage would be traced to these traitors. Clan warriors discovered descendants of the Not-Named Clan durin the invasion of the Inner Sphere. Their law decreed that these survivors must die, and now their children must also die. 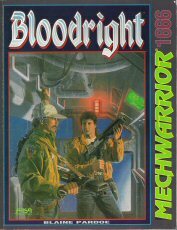 Bloodright is a roleplaylng adventure for MechWanior, Second Edition. Set in the BattleTech universe of the year 3053, the adventure is for Clan player characters. The story opens on the battlefield of Tukayyid, and sends the characters on a quest across the Inner Sphere that could bring them honor and glory, or disgrace. The adventure includes new Clan archetype! new OmniMechs, complete statistics for the Broadsword Class DropShip, and a section on roleplaying Clan characters." "You’re a merc -- you've been a merc for years. Now you've been offered a job that looks like a milk run. You're a little suspicious because the pay is good. Real good. So good that you take the job because you need the money, knowing all along that you'll regret this decision. But you've been between a rock and a hard place before. The problem is, nobody's been between ComStar and Word of Blake before. No amount of money is worth that. 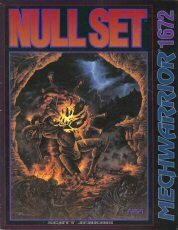 NULL SET is a roleplaying adventure for use with MECHWARRIOR, SECOND EDITION. 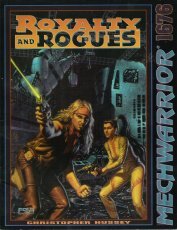 Set in the BATTLETECH universe of the year 3054, the adventure sends mercenary player characters on a job that goes sour, and they must undertake a desperate quest for the truth that will save them from execution. The adventure includes information on the Mercenary Review and Bonding Commission and details about Harlech, the Wolf's Dragoons' home city on Outreach." "A deceptively simple rescue mission leads the player characters to the back alleys of Port Krin, one of the foulest pits of corruption in the Periphery. 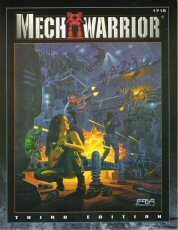 All is not what it seems in this MechWarrior adventure, as the characters uncover a pirate stronghold, a secret romance and a conspiracy to overthrow a planetary government." "Adventure awaits on the Game World of Solaris VII, where death is a sport and the stakes are your life: The first in a series of MechWarrior's Guides, this book combines source material and complete information for campaigning on Solaris VII, along with a full-length adventure for MechWarrior, Third Edition. 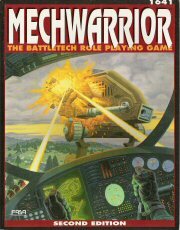 Also included are detailed 'Mech dueling rules, in high demand since the original Solaris VII box set went out of print. 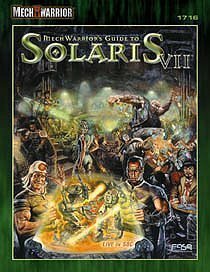 Adventure awaits on the Game World of Solaris VII, where death is a sport and the stakes are your life: The first in a series of MechWarrior's Guides, this book combines source material and complete information for campaigning on Solaris VII, along with a full-length adventure for MechWarrior, Third Edition. 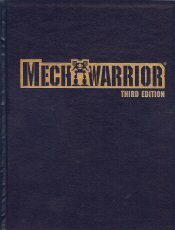 Also included are detailed 'Mech dueling rules, in high demand since the original Solaris VII box set went out of print." "For two centuries, the Clans have genetically bred their warriors. Clansmen are evaluated from birth, with their entire lives revolving around Trials of might-makes-right that whittle away the chaff and create the ultimate soldiers. Dive into this unique warrior culture and battle your way to glory to gain a Bloodname and pass your superior genetic legacy to the next generation. The MechWarrior's Guide to the Clans the second volume in the MechWarrior's Guide series for MechWarrior, Third Edition. It provides you with all the material you need to launch your own Clan campaigns. 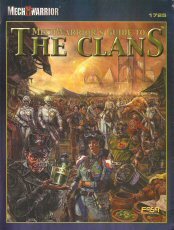 This volume contains seventeen new affiliations, as well as more than a dozen new Life Paths unique to each Clan, complete information for campaigning among the Clans and a full-length adventure."